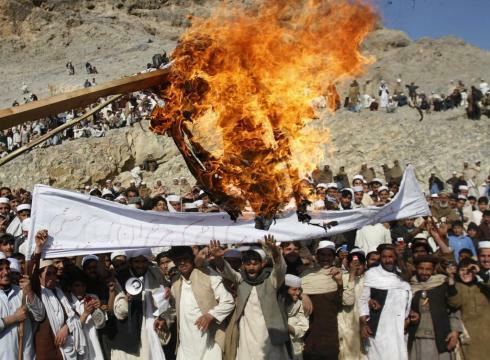 U.S. soldiers burning Qurans at Bagram Air Field in Afghanistan has prompted violence and protests across the country, leading to at least 20 deaths. Noticeably absent from the fray, however, is an area that has seen more than its share of violence — Helmand province. Helmand, occupied by some 17,000 Marines, has avoided bloodshed tied to the controversy so far, Maj. Gen. John Toolan told me today during a phone interview. He attributed the success to a plan hatched by Mohammad Gulab Mangal, Helmand’s governor, to quickly respond with several respected mullahs to areas where anger over the burning of the Muslim holy book swelled. The governor asked Toolan to set aside a helicopter in case it was needed to get to a protest before it boiled over into violence, the general said. In Lashkar Gah, Helmand’s capital, Mangal and the mullahs also met yesterday with a charged crowd of people at a soccer stadium. Toolan said the governor reiterated that it was ignorance, not hatred, that prompted the soldiers to burn the Qurans — and then the crowd dispersed. Toolan also instructed his Marines to minimize operations today, he said. Muslims typically attend the mosque on Fridays, and the general was concerned inflamed rhetoric there combined with regularly patrolling could incite violence. It’s an encouraging sign for a section of Afghanistan in which U.S. forces will be drawn down significantly this year. As reported here, Toolan said today he expects there will be about 7,000 Marines left in Afghanistan by October. Sounds like a good time to send a drone strike.